Martina Filjak in New York. Photo by Hiroyuki Ito. 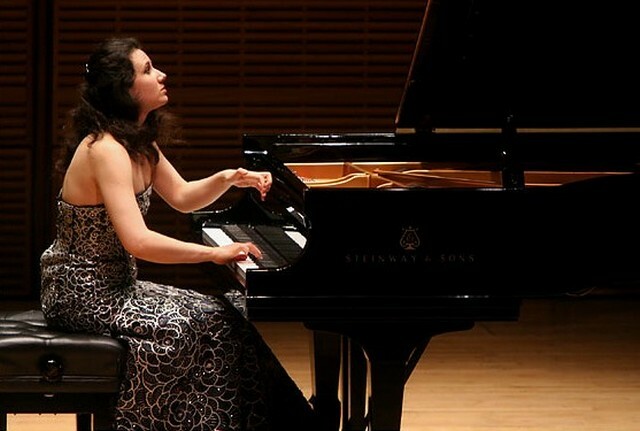 The Croatian pianist Martina Filjak spent her 31st birthday on Monday hard at work, at least during the evening hours. 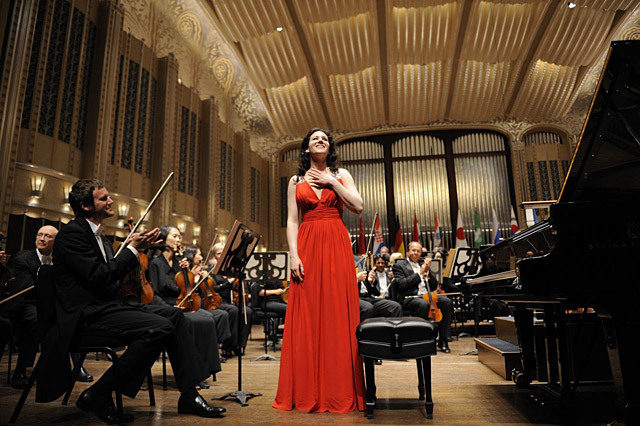 She gave her New York recital debut at Zankel Hall, playing an adventurous and demanding program. 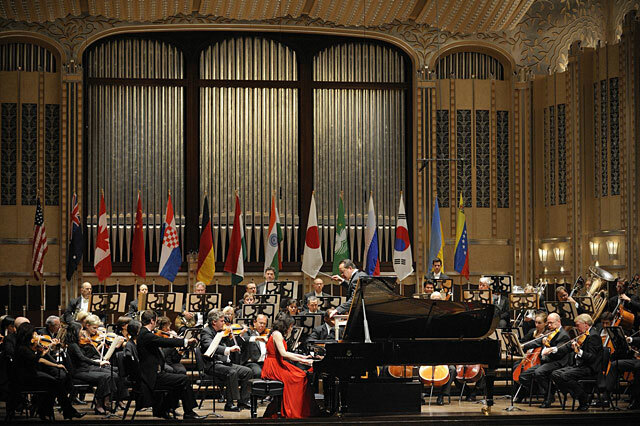 This engagement was part of Ms. Filjak's prize for winning the prestigious Cleveland International Piano Competition earlier this year. The critical praise and general buzz she received for her performances during the final rounds seem merited, given the brilliance, sensitivity and imagination of her playing here. 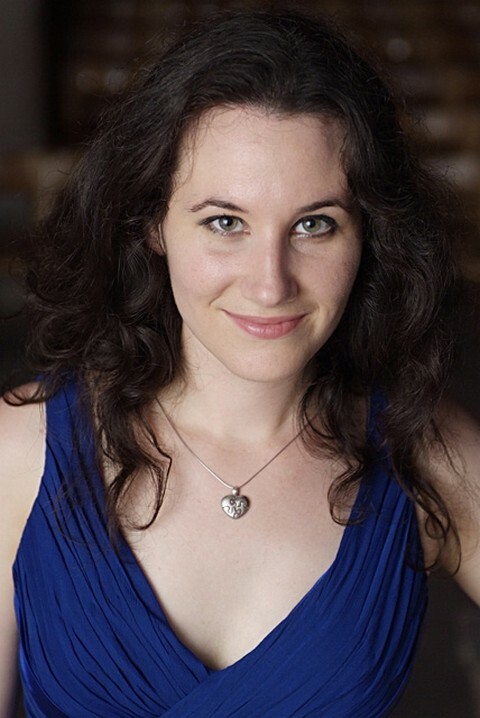 Born into a family of pianists, Ms. Filjak, who has a lively and attractive stage presence, received excellent training from an early age, which surely accounts for the resourcefulness of her technique and the naturalness of her musicality. Yet, from the first work she played, "Une barque sur l'océan" from Ravel’s "Miroirs," she demonstrated striking individuality. The music evokes a boat atop rolling ocean waves through rippling piano arpeggios that build and crest across the entire keyboard. I tend to like this piece played with rhythmic impetus and clarity, so that the textures do not dissolve into an Impressionistic haze. Ms. Filjak took a somewhat slow tempo and produced shrouds of milky piano sound. Yet she held the tempo with eerie poise and played with such uncanny delicacy that I was drawn right in. For the first part of the program she chose works that explore elements of nature in different ways. From Ravel’s ocean she segued to three of Luciano Berio’s "Six Encores," published in 1990. These ingenious pieces evoke, in turn, water ("Wasserklavier"), fire ("Feuerklavier") and air ("Luftklavier"). The water piece is not what one might expect, but a short (two-minute) and elusive work, like some modern version of an Italian Renaissance ode to water. In the fire piece, on the other hand, you can hear the crackling flames in the piano’s spiraling, hyperfast figures and ominous dissonant tremolos. The air piece, again a curiosity, is obsessed with cyclic riffs and bursts of skittish, gritty runs. Ms. Filjak played throughout with vibrant colors and utter command. Bartok's "Out of Doors," a 15-minute suite in five movements, explores the elemental side of nature, complete with pungently modern evocations of Hungarian peasant drums and pipes, and modal folk tunes played in eerie octaves. During the daunting final piece, "The Chase," Ms. Filjak boldly dispatched the leaping chords and relentless volleys, playing with chiseled but never percussive sound. After intermission she took on Beethoven's mighty "Hammerklavier" Sonata. My guess is that she loves this work especially for its ruminative, profound slow movement, which she played with noble calm and quiet intensity. In the final movement, the astonishingly complex fugue, it was exhilarating to hear Ms. Filjak unravel the thorny counterpoint with such a light yet clear touch. For me she did not convey the audacious, almost crazed grandeur of the opening Allegro. She even omitted the repeat of the exposition section, which is essential to the architectural impact of the piece. Still, Ms. Filjak is a pianist to watch. And I hope she had some birthday fun at the postconcert reception. Martina Filjak with her fans in China, in front of the poster announcing her concert.